During this past week, I revisited my collection of reflection photographs in order to continue illustrating just how fascinating reflections can be. While pondering which reflection to feature this week, I received an image from my daughter, Maureen, who is studying photography at the Art Center College of Design in Pasadena, CA. Her assignment this week was 'self portraits.' Photographing yourself often utlizes the use of reflections since it is quite difficult to be on both sides of the camera at the same time! The image she sent to me (Entitled: "Born With a Silver Spoon") is so creative, my decision was made immediately to share HER reflection image with you this week. 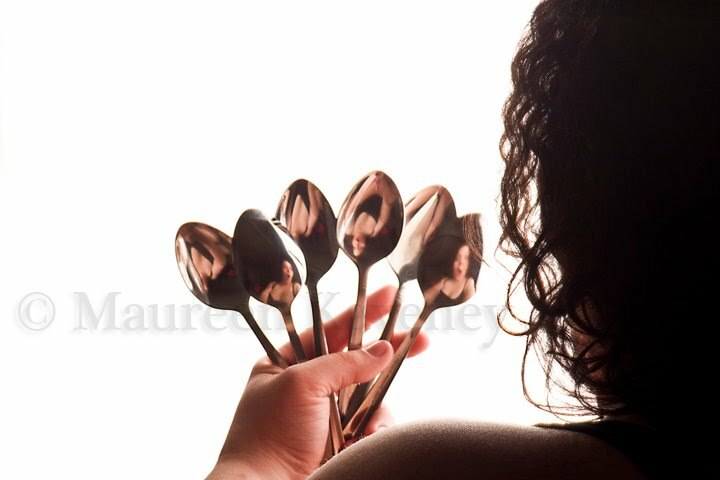 Be sure to enlarge the image by clicking on it to see how each spoon reflects her likeness.